Height: 45 in. Width: 30 in. Depth: 31 in. In November 2016 the Consumer Product Safety Commission announced the recall of about 2.8 million Samsung top-load washing machines. The washing machine top can unexpectedly detach from the washing machine chassis during use. For full details read the recall notice. Click here for more information from CPSC and click here to check the Samsung site to determine if you have an affected unit. 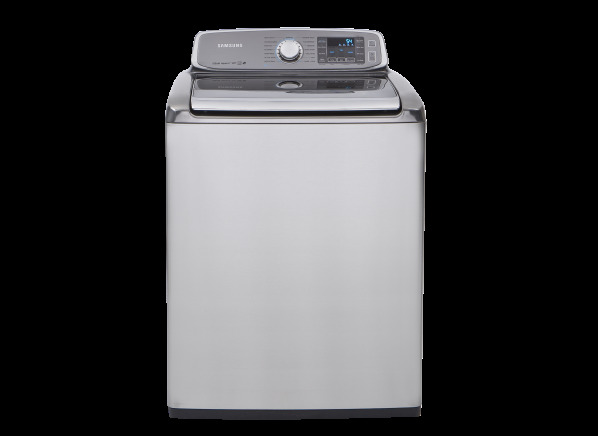 The Samsung WA56H9000AP is part of the Washing machine test program at Consumer Reports. In our lab tests, Washing machine models like the WA56H9000AP are rated on multiple criteria, such as those listed below. Results in the following chart are gathered from Consumer Reports’ 2018 Fall Survey of 22,324 top-load HE washers, owned by members who purchased a new machine between 2008 and 2018. Energy star Energy star Qualified by the U.S. government's Energy Star program for low power consumption. Water levels Water levels In our opinion, four or five water levels are sufficient. An automatic water-level control--standard on front-loaders--generally improves water efficiency.